Social Targeting: Are Advertisers Being Smart or Stalking You? “Social” has always had a positive connotation to it, but with social targeting, I’ll let you decide. Social targeting is an advertising placement method used by online ad publishers that’s based on your conversations and interactions in the social media space. Ad publishers use data such as your status updates, tweets, photos and other online actions to help determine your interests and, therefore, determine the relevance of potential ads targeting you. Social targeting also looks at your connections and the strength of your connections across certain networks, such as Facebook, Twitter and LinkedIn. Advertisers assume that people you are strongly connected with will share similar interests and then will target them with similar ads. You go to a brand’s website or Facebook page and buy a certain product, download something or sign up for a service. When your top friends (people you interact with most on your social networks) go online, they will see ads for the same products and services that you bought, downloaded or signed up for. Making ads more relevant obviously makes a ton of sense. However, as someone who values privacy, I still get creeped out by targeting methods that use planted cookies to track me. My preference is still semantic targeting—the cookie-less form of online ad placement—which I’ve discussed here before, most recently in The Consumer-Friendly Wave of Digital Advertising. If you’re not sure what semantic targeting is, read more of what I’ve said in Catch the Wave, the Third Wave of Digital Advertising. But, I don’t want you to take my word for it. Let me know what you think. How do you feel about being tracked on the web and having that data being used by advertisers? If you subscribe to magazines, you know the direct mail push that comes anywhere from halfway through your subscription to the date of expiration. Well, my TIME Magazine is running out and boy do they have an offer for me! 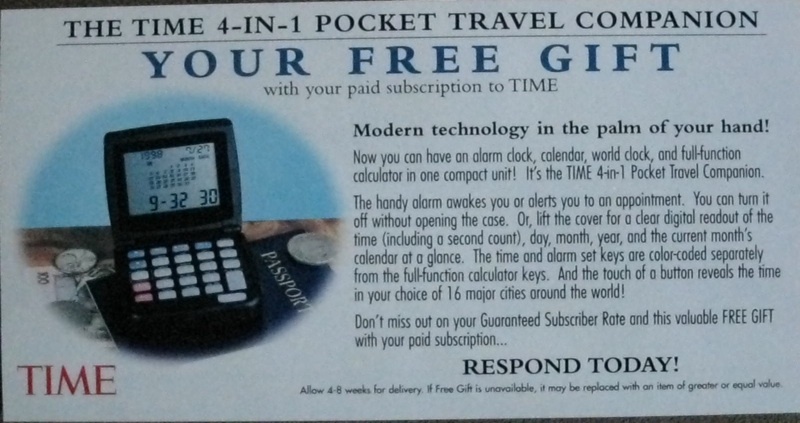 The TIME 4-in-1 pocket travel companion—FREE! “Modern technology in the palm of your hand!” they say. Now you can have an alarm clock, calendar, world clock, and full-function calculator in one compact unit! This handy alarm awakes you or alerts you to an appointment. You can turn it off without opening the case. Or lift the cover for a clear digital readout of the time (including a second count), day, month, year, and the current month’s calendar at a glance. The time and alarm set keys are color-coded separately from the full-function calculator keys. And the touch of a button reveals the time in your choice of 16 major cities around the world! Don’t miss out on your Guaranteed Subscriber Rate and this valuable FREE GIFT with your paid subscription…RESPOND TODAY! Please, please, can I guess? You already have a cell phone, right? And the cell phone can do much more than this silly little thing. Who is this device valuable to? Modern technology in the palm of your hand—ha! Really, TIME, it’s time to get with the 21st century. No wonder magazines are in trouble. With the Phillies out of the playoffs (already…ugh, don’t get me started), it’s time to focus on football. My attention lately has been drawn to Verizon’s NFL Mobile commercials. I love these commercials—and I think you will too. Why? Because of the ENERGY within them. The energy comes from the music and is paced perfectly to relate to the start of the football season. The beginning gives a sense of anticipation—with just the whoosh of the football—and then participation, with more footballs flying through the air and everyday people catching them. Overall, it’s a creative yet simple idea that’s very well done. Now that we’re a few weeks into the season, this next Verizon NFL Mobile commercial seems perfect too. This commercial amps up the energy with Drew Brees’ and the Saints’ pregame chant made famous in their Super-Bowl-winning year. I love that chant! But even if you don’t. I’m sure there’s something that your team does that gets you fired up. And that’s exactly the point. That little spot of humor at the end fits nicely too. It gives the ad a nice sharp ending that quiets your brain and readies you for the call to action, which Verizon certainly wants you to hear. Maybe next year, Verizon can create a baseball ad that will pump up the Phillies enough so that they remember how to hit and WIN! AGAIN! A girl can dream, right? Think advertising and paper towels and what’s the first thing to come to mind? “Bounty, the quicker picker upper,” right? Kimberly-Clark’s Viva is trying to change that with it’s own advertising campaign featuring Dirty Jobs star (and Ford spokesman) Mike Rowe—and his parents. Real-life relatives don’t always make for great TV, but Mike Rowe’s parents are cute as can be. His mother even seems, at times, like she’s not on script. Everyone talks about authenticity in advertising, especially in the age of social media. And Viva found a fantastic way to be authentic. Mike Rowe is a very charming spokesman and his Dirty Jobs gig makes him perfect for this role. Viva struck gold with being able to include Rowe’s parents too. Whose mother didn’t chase after them as they tracked dirt through the house? Two words come to mind—relatable and likeable. You can’t help but smile as you watch these ads. And because they used his real parents rather than actors, you’re more likely to believe the paper towel worked on the grill instead of believing Bounty’s claims. Seems like Viva is coming up with its own ABCs of advertising—Authenticity, Believability and Charm. It’s funny, Bounty ditched their “quicker picker-upper” line for their new “Bring it,” call to action, and Viva seems to be doing just that.